Slice seeding…used to fill patchy or thin areas to improve the appearance of an established lawn. 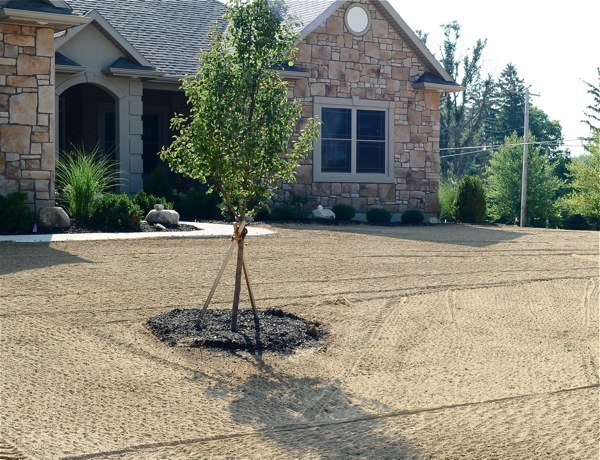 For bare soil…hydro-seeding is our preferred method. Hydro-seed offers the advantage of a one-batch mix. The customer does not have to worry about straw blowing around the yard. 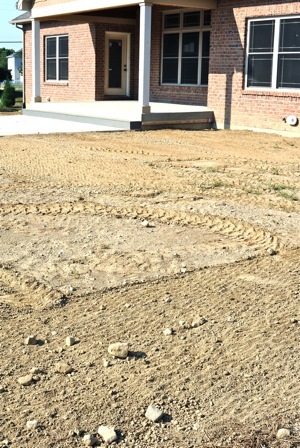 Typical lawn before “rock hounding” process to remove rocks and debris. But before the fact of seeding, Ever-Green staff will expertly “rock-hound” the property to remove rocks and create a seed bed. This is important to the start of a successful new lawn, and a tremendous labor saver over manually using a rake and wheelbarrow to remove unwanted stones and other debris from the seed bed. The above photo shows how things will look just before seeding. If a picture is worth a thousand words, compare the two photos (above and left). We think you’ll agree that Ever-Green’s professional treatment of a new seed bed gives you every advantage towards a successful start. By the way, the hydro-seeding process offers the customer a variety of grasses from which to choose. Seed germination, with proper watering, can vary from seven days to six weeks, depending upon the customer’s selection. Ever-green hydro-seeding gives a new lawn planting every advantage for a fast and healthy start. 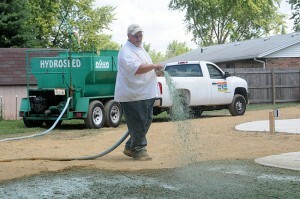 Once seeding is complete, Ever-Green Lawn Care division would like the opportunity to continue servicing your property. We apply a special starter fertilizer, high in phosphorus, that will gently nurture and help establish a healthy lawn. We can…we will. For your pride, it’s our pleasure!